Note: This post initially appear on the Culture on the Edge blog just after the Paris attacks on November 13. Given our goal at the Bulletin blog to keep this conversation going, a re-post is in order. The deadly attacks in Paris last Friday have generated sincere expressions of shock, solidarity, mourning, and anger from around the world, yet that response also generated critical hashtags such as #selectivemourning. As many have discussed in social media and articles, bombings in Beirut the previous evening received only limited coverage in the US media and few mentions on social media. We can blame the media, but that is a little simplistic, as the media not only directs our interests but also reflects them. If sufficient numbers in the audience clamored for more information about the attacks in Beirut or previous attacks on civilians over the past twelve months in Nigeria, Kenya, Yemen, Afghanistan, and Pakistan, perpetrated by a range of forces, then the media coverage would increase. In fact, most who have pointed out the imbalance in the coverage are only doing so in the light of the Paris attacks. Few changed their Facebook profile photos for solidarity with Lebanon, despite it appearing in the news. But why does Paris, then, receive such extensive, emotional coverage when some of the other attacks actually had more victims? We relate to the victims more when we can see ourselves and our loved ones as similar, including notions of race, class, culture, and experience. Many of us have either traveled to Paris, hope to travel to Paris, or know people who have traveled to, or possibly even live in, Paris. Beyond specific links to Paris, most of us can imagine attending a concert, eating in a restaurant, or attending a major sporting event in a modern city (which we often erroneously envision as western European or North American). We are less likely to imagine ourselves or people whom we know in a Nigerian village, a Kenyan school, or a Beirut neighborhood (however cosmopolitan — unbeknownst to us, of course — it might be). In other words, our response to Paris is largely about our own concerns with mortality and fear for our safety and the safety of those close to us rather than some abstract notion of human solidarity. This point intersects with the ongoing debate in the US between the Black Lives Matter movement and those who counter that All Lives Matter, as the unbalanced responses to tragedy demonstrate that few if any of us honestly respond as if all lives matter equally. We as societies repeatedly sacrifice the lives of unknown others to preserve our freedoms, our continued access to cheap consumer goods, and our privileges. Civilian casualties are an aspect of war, embargoes, and economic globalization. And this is why Black Lives Matter arose. Since few of us automatically place the same value on the lives of those with whom we do not immediately connect, because of a combination of factors such as race, experience, and socio-economics, marginalized communities have to push others to recognize the humanity of people in those communities. The All Lives Matter counter-assertion, coming primarily from the majority communities and those with privilege and power, reflects a strategic defense then of the status quo, not a principle for action. 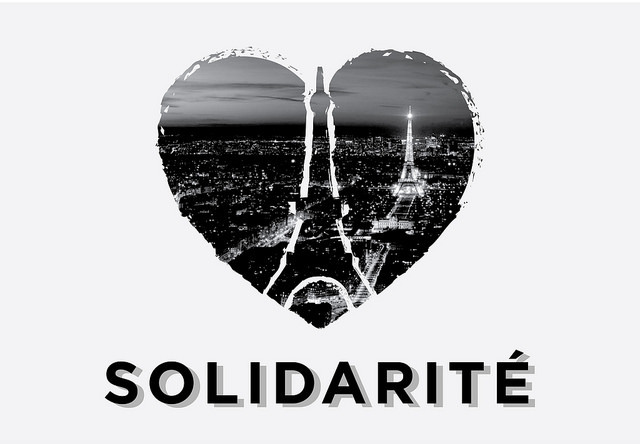 Responding to horrors such as attacks on Paris or Beirut with grief and solidarity is important to the people of those cities and for ourselves. However, in identifying with select victims and becoming self-satisfied by our moral superiority as human beings, we should admit that the responses to Paris and Beirut are more about us, our interests and concerns, than Paris, Beirut, or our common humanity. This entry was posted in Politics and Religion, Religion and Society, Religion and Theory, Religion in the News, Steven Ramey, Theory and Method, Theory in the Real World and tagged Black Lives Matter movement, Culture on the Edge. Bookmark the permalink. That’s true and not true. We care less about things that happen outside of our own “cultural circle” – yes, and I believe it could be also applied to USA society caring less about its black citizens, or the actual natives of the continent. But there’s more to it. As callous as it sounds, if a person sincerely grieved every victim around the world, they would probably need some serious medication, and a nurse or two making sure they eat and watching them for singes of doing anything stupid. For that reason, we were given a number of fail-safes. One is not grieving (much) those from outside your group, and it comes straight from our evolutionary past – your tribe loosing people weighted down your own chances of survival, while the other tribe dying out sometimes even improved them. Another is quantity: past a certain amount, the victims loose individuality, or even identity, and we care less. We don’t consider them as persons anymore, and being a victim is the only trait attributed to them. As it was once said, one death is a tragedy. Ten thousands of them is statistics. And finally, routine. Did You ever consider grieving car accident victims? There’s several every week, and people die in them. Unless you knew the victim personally, you don’t consider it a tragedy to stop in your tracks for; it’s a sad, but routine, death. Sadly, same goes for car-bomb deaths in the Middle East. Why does it all matter? Well, for one, the number of victims doesn’t necessarily make for a tragedy in our minds. Also, not knowing much about the “outside”, we don’t have many expectations about what it’s supposed to be like. When we hear about a bomb or an attack, we just assume that “these things happen there”. Sadly, sometimes we’re right about that. It all makes the killings in places like Beirut, Pakistan or Yemen routine and anonymous in our minds. What made us care more about Paris wasn’t just seeing ourselves in a similar situation with the eyes of our subconsciousness. There were two very important components beside that. One was the shock of seeing a place we consider safe disrupted by death and violence. While we can assume that Beirut is just “that kind of place”, we can’t do the same with Paris. The other, maybe even more important is how it’s been done. Opening fire to people sitting in a coffee shop is much more personal, much more shocking than an – even much larger – amount of deaths by a bomb or an earthquake, or a (generalized) war. It’s a heart attack/car accident versus murder kind of reaction. And of course, the fact that it’s another move in a not-so-cold war between the West and the [Arab? Muslim? terrorists? insert the word you consider appropriate] does help to spread all kinds of news about the attack in media.